There is a term in the Air Force known as the bio-line. Psychologists started looking hard at this bio-line back in the 80’s. Basically flying a plane uses the left half of the brain, all the additional (military in this case) information is processed through the right brain. During certain situations pilots were passing out in the cockpit during simulations. If a pilot of a fighter jet passes out or becomes unresponsive the jet levels out. Which is a bad thing because then the enemy can lock onto its target. They figured out that there was so much information that the right brain was starting to encroach on the duties of the left brain which over stimulated the pilot who would then black out. Oddly this only happened in simulations. Only when the pilots were able to answer question anonymously did the truth come out. When in flight pilots instinctively knew that they were being overwhelmed and would turn off all ‘non essential’ equipment and would fly into battle using their wits more than anything. I understand that thankfully for the most part this issue has been resolved. But it does go to show that sometimes technology can be too much. There is a large cable company that deals with cutting edge equipment in the communications field. There is a constant stream of new products hitting the market and ending up in our homes. The problem is the future really is now. This stuff is coming out so fast and furious it even leaves the installers confused at times. Not all that long ago a TV had two ports, one for the plug so that it plugs into the wall and another for the cable that went from the wall to the back of the TV. Then came the cable box which was still pretty simple, cable goes from the wall, to the cable box, and from the cable box to the TV. Now there are a multitude of cable boxes, just for standard digital TV itself, not that pesky analogue stuff of 8 years ago. We also have a multitude of HD boxes and let’s not forget about HDDVR’s. There are boxes that have HDMI cords, others have component cables. There are host boxes where you can have one DVR and watch that DVR from the ‘slave’ boxes which can be in other rooms in the house. Some cable boxes are the size of two decks of cards, others are as large as an old record player, (remember record players?). Basically there is a lot of equipment that technicians have to deal with. The following conversation took place between a technician which installs this type of equipment and a co-worker who works behind the scenes with the different types of equipment. In no way is this conversation a reflection on either of the two parties, it is however, a reflection on how fast things are changing in the field. Co-Worker goes and gets the tech some DVR’s which are completely different, different colour, different dimensions, different look figuring it would be easier for the tech to spot the difference amongst all the other pieces of equipment on the truck. My grandmother liked tell the story of the first time she saw an automobile. She was young and living in England and somebody came down her street in a horseless carriage. Everyone got to go for a ride, when her turn came it scared her, how could it possibly be moving on its own? So she jumped off. To my knowledge she never did learn to drive. I always envied that particular generation. Imagine having lived before the advent of the automobile. Then seeing the first ones, and living well into the next century. I thought never again will the world see such an amazing transformation. The other day I was telling a story to one of my co-workers and had to stop in the middle and explain that at the time there were no cell phones. A few minutes later I had to explain that there were no computers either. Sometimes I feel old. Is this how my grandmother felt , what of her grandmother? And what will my grand nephews and nieces see? I love technology. However there is a part of me that would love to live off the grid. Self sufficient, no job to go too, have a little windmill or solar energy, no computers or phones, but who am I kidding? While I would have a hard time giving up the internet, I think I could do it. I could not however, give up cable. But I do wonder/worry sometimes that it is all just too much. The other day my sister asked her son if he wanted to play with cards. Now understand I always have a deck of cards near me. I have three at my desk at work. A few in my backpack which goes to work with me. At least one deck on my nightstand. And when I look at my end table I see three decks, but I know there are a bunch more in the drawer. Remember my background is magic, I’ve learned a thing or two and while I don’t perform much I’m addicted to what magicians call card flourishes. And no, if you click on the link that is not me, I don’t have the time or patience to be that good. That aside, sad as it is to say, cards play a big role in my life. So I found it a little worrisome when my sister said: “little boy, would you like to play with cards? go get my iphone” I do play solitaire on my ipod so it should not have been a shock to me. But I did start to wonder does the boy even know what a deck of cards is? Well of course he does. His grandparents own a magic shop. But how many kids don’t, or soon won’t. My sister found a hipsta app for the phone. I looked it up in the app store. It is a Lego application. Yes you can build things with lego on your iphone. Today I got a call from my mother-in-law, she could not get online with her laptop. She could with her ipod. I know she could with her desktop because that actually has a cable. Later in the evening I was thinking about that call, my wife, myself and my mother-in-law each have three ways to access the internet and god forbid if one of those ways goes down, we are lost. Just the other day my wife asked me if I remember dial-up? Of course I remember dial up, heck I remember life before computers. Dial up was horrible, you turned on your computer went out had something to eat, got yourself a drink, used the bathroom, and if you were lucky when you got back to your computer, you were online. Then it would take a minute or two to actually get to a website. Yet it was amazing, fascinating the world was at our fingertips. Now if the site doesn’t come up before I finish clicking on it in my favourites I worry something is wrong with my connection. And I do find myself getting bored surfing the web, even though the world is literally at my fingertips. I used to keep up with technology, I am confused by the 3G and 4G thing, more interesting, I don’t really care. 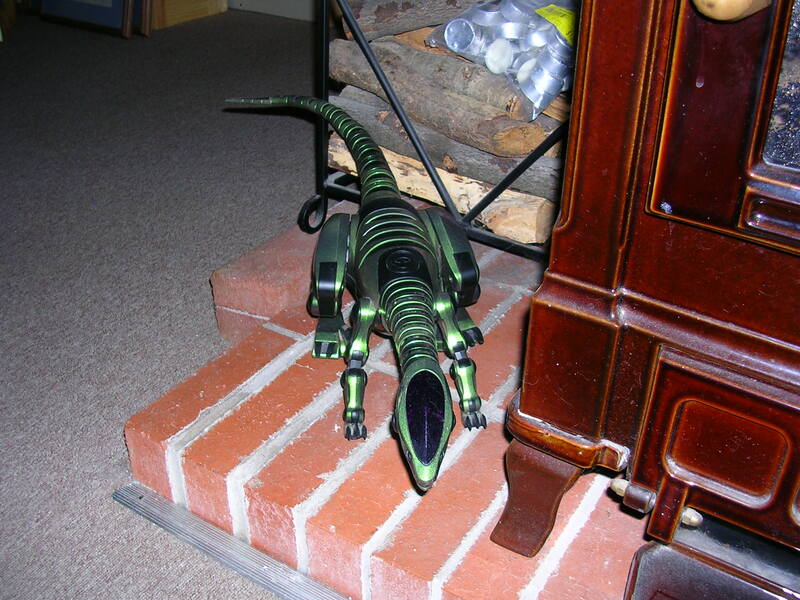 Is it just me, or doesn anybody else find it sad that I have three ways to access the internet, four if you count the play station, I’ve a cell phone, a robotic vacuum cleaner, a robot lizard that is sensative to sounds and will patrol the house on his own, yet I’m still behind the times. I was in Barnes and Noble where they are heavily advertising ‘The Nook” which if you don’t know is an electronic book. I love technology and we will be getting a Nook but I really identified with Grandma.